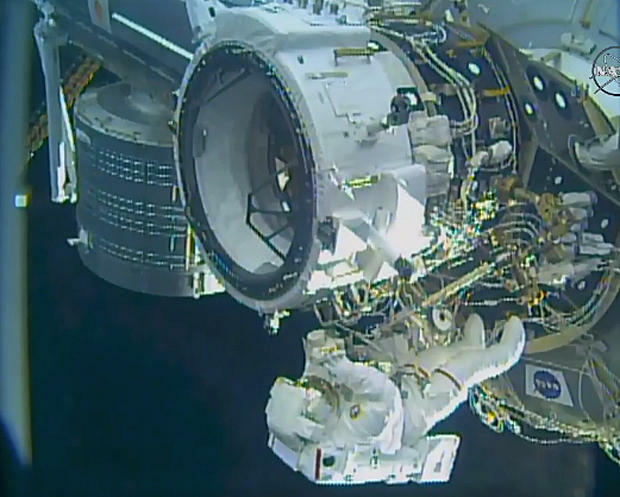 Two spacewalkers attached a new docking port to the International Space Station Friday, clearing the way for U.S. crew ferry ships being built by Boeing and SpaceX to begin test flights to the lab complex next year. It was a key step in NASA’s drive to regain independent access to the lab complex for the first time since the shuttle fleet was retired in 2011. Attached to the station’s no-longer-needed shuttle port at the front of the station, the Boeing-built International Docking Adapter will allow spacecraft from both companies to bring crews to the outpost, ending NASA’s sole reliance on Russian Soyuz ferry ships. A second IDA is expected to be attached in 2018. Williams, making his fourth spacewalk, and Rubins, making her first, began the spacewalk at 8:04 a.m. EDT (GMT-4). After exiting the Quest airlock and collecting tools and foot restraints, they made their way to the front of the station where the shuttle port -- pressurized mating adapter No. 2 -- extends from the forward end of the Harmony module. The new docking mechanism was carried up to the station aboard a SpaceX Dragon cargo ship in June. Overnight Wednesday, the station’s robot arm pulled it from the Dragon’s unpressurized trunk and positioned just in front of PMA-2 to await the spacewalkers. Once in place on either side of the mating adapter, their feet locked in restraints on PMA-2 for stability, Williams and Rubins attached tethers to the IDA and cinched it in before connecting cables to provide power to sensors, heaters and motors needed to drive home 12 latches to lock the component to the old shuttle port. Other than a minor problem freeing up one balky cable connector, the astronauts had no trouble staying ahead of their timeline. After sensors indicated the IDA was properly aligned, Japanese astronaut Takuya Onishi, working inside the station, sent commands to drive the hooks closed, firmly locking down the IDA. Williams and Rubins then reconfigured the power cables, removed a cover over the end of the docking adapter, covered up no-longer-needed reflectors used by approaching shuttles and installed new laser reflectors that will be used by the Boeing and SpaceX spacecraft to help determine distance and relative velocity. NASA originally hoped to get the first IDA installed last year, but the initial unit was destroyed when the SpaceX Falcon 9 rocket carrying it to space suffered a catastrophic failure. A replacement IDA is being built by Boeing and should be ready for installation in 2018. In the meantime, the IDA installed Friday will suffice for initial test flights starting next year. SpaceX is expected to launch an unpiloted Dragon test flight early next summer, followed by a crewed “demo” mission a few months later. Boeing expects to launch an unpiloted test flight late next year with the first crewed test mission in early 2018. The new spacecraft will give NASA astronauts their first independent access to space since the shuttle fleet was retired in 2011. And because SpaceX’s Dragon and Boeing’s CST-100 can carry four astronauts compared to three aboard the Russian Soyuz, NASA plans to add a seventh crew member to the space station to increase the amount of research that can be carried out. Even though the commercial crew ships will end NASA’s sole reliance on the Soyuz, at least one U.S.-sponsored astronaut will launch aboard each Soyuz and a Russian will fly aboard each NASA spacecraft through the life of the station program. That strategy will ensure at least one astronaut or cosmonaut can remain aboard the station to operate critical systems in the event of a problem that might force one of the other ferry ships -- and its crew -- to depart. The IDA installation work took about four hours to complete, giving the spacewalkers time to carry out lower-priority tasks. Rubins routed a cable that will be needed by the second IDA while Williams worked with an ethernet cable that will be needed by a future Russian module. “I see a beautiful sunrise, Tom,” Rubins radioed astronaut Tom Marshburn in mission control as the shuttle sailed high above the south Pacific Ocean. “You’ve got the best view, that’s great,” Marshburn replied. With their primary objectives complete, the astronauts agreed to carry out two final “get-ahead” tasks, but the work was called off when Williams ran into intermittent problems with his helmet’s audio feed. While he could still hear flight controllers with one ear, flight controllers decided to go ahead and end the spacewalk. After carrying their tools and tethers back to the airlock, Williams and Rubins floated back inside, shut the hatch and began repressurization at 2:02 p.m., closing out U.S. EVA-36. Duration was five hours and 58 minutes. It was the 194th spacewalk devoted to station assembly and maintenance since construction began in 1998 and the third so far this year. Adding Rubins to the list of veteran station spacewalkers, 124 astronauts and cosmonauts have now logged 1,210 hours and 46 minutes working outside the station, or 50.4 days. Williams and Rubins plan to stage another spacewalk Sept. 1 to retract a cooling radiator, to install an HD camera and replace an external light.